This post is near and dear to my heart. 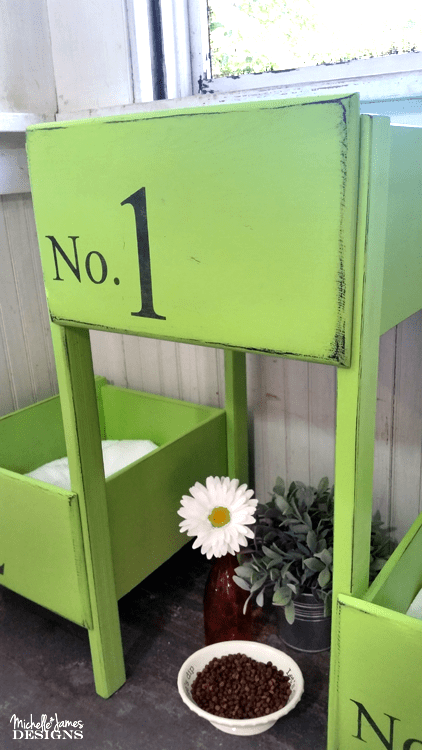 I have a great tutorial to show you how we made this awesome DIY cat bed using re-purposed drawers but I have to talk a little bit about our indoor cats and about the cats we feed outside as well. Most of our indoor kitties were strays that we found on our property that had either been abandoned or were sick. We took PeeWee in as an adult cat but he had been left in a barn setting with no claws in the winter to fend for himself. He had already been rescued from that environment but those people couldn’t keep him so we took him in. Our outside kitties are not really ours but we house them, feed them and try our best to find them homes. I guess we foster them. We fix the females when they are old enough and get them their shots. Most of the time we find homes but sometimes they just hang around until they get tired of us I guess. 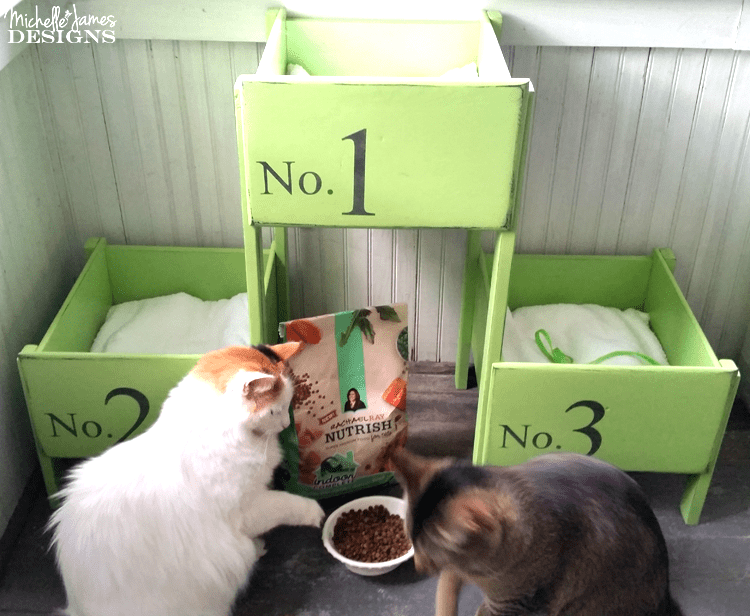 Not too long ago we changed the dry food we give our indoor cats to the Rachael Ray™ Nutrish® Indoor Complete Chicken with Lentils & Salmon Recipe. This food is intended for cats over 1 year old so we needed to wait until Sasha was one year. 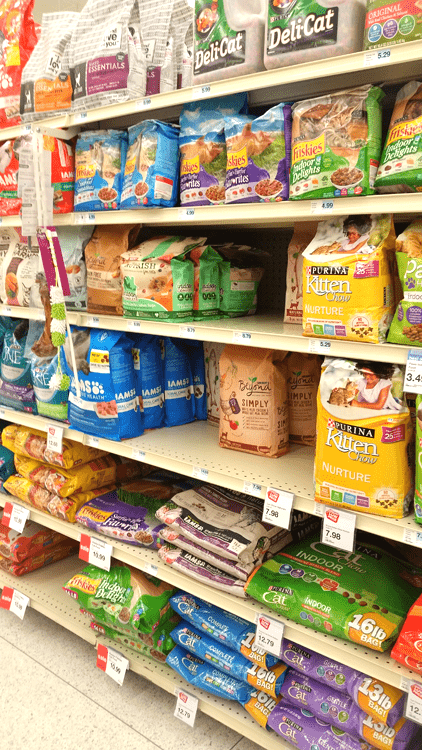 But the Nutrish Indoor Complete foods have been the only one we have tried that all the cats like. Plus there have been other health benefits for them as well. We have noticed that the heavier cats are looking slimmer and that they digest it better since there are less kitty messes (vomiting) to clean up. Thank goodness! So I know they are getting the nutrition they need. Sometimes cats have a hard time switching foods. If this is the case you can slowly add the Nutrish Indoor Complete into the current food and decrease the amount of the current food over a period of about a week to 10 days until you have completely replaced it. 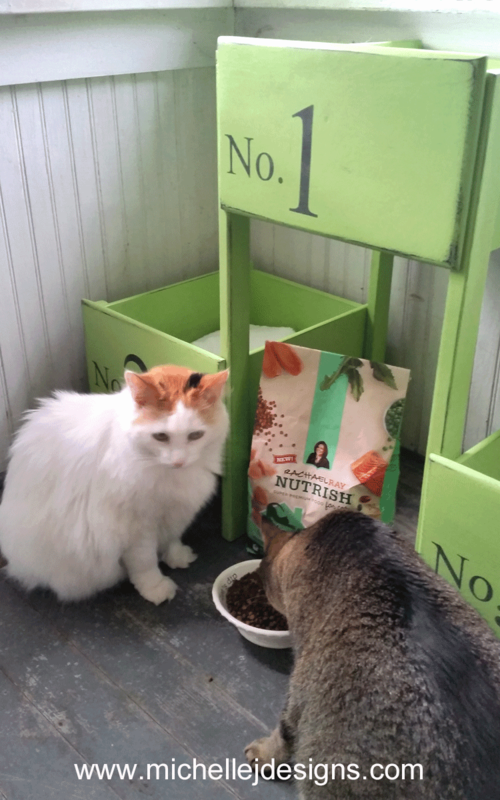 When I researched it further I found Nutrish Indoor Complete contains a real superfood blend to meet the complete needs of your indoor cat and contains US farm raised chicken as the #1 ingredient and real salmon. They must love that stuff because they eat it up! But the best part of this, I just found out, was that a portion of proceeds from each sale of Nutrish is donated to The Rachael Ray Foundation, which helps animals in need through Rachael’s Rescue. As of December 2016, Rachael’s Rescue has donated more than $17.5 million dollars to pet charities and other organizations that do good for animals. 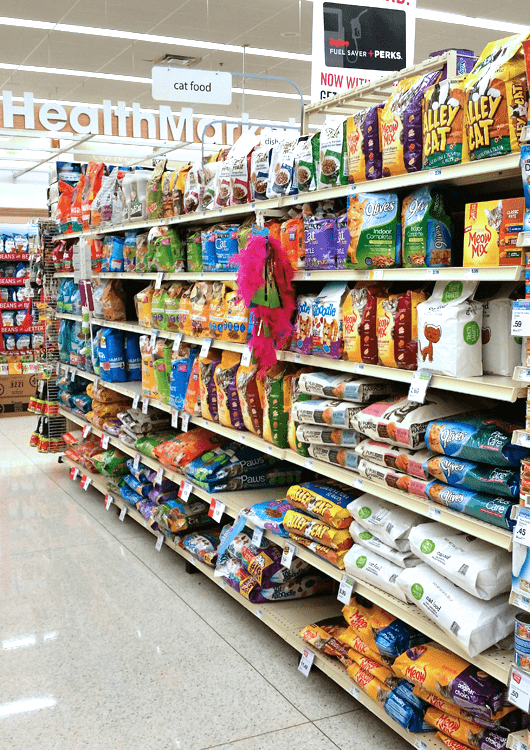 The funds are used for food, medical supplies, treatments, and more for animals in need. Did you guys know that Rachel Ray did all this? I didn’t! I am super impressed with this entire thing. And I have a link for a $2 off online coupon for Nutrish Indoor Complete food so you can try it yourself. It really has been a good thing for us. This is a printable coupon. Just click on the photo and print. The coupon is good through the end of the year and is good for 30 days after you print it. You can print it twice! Use the coupon and check it out. 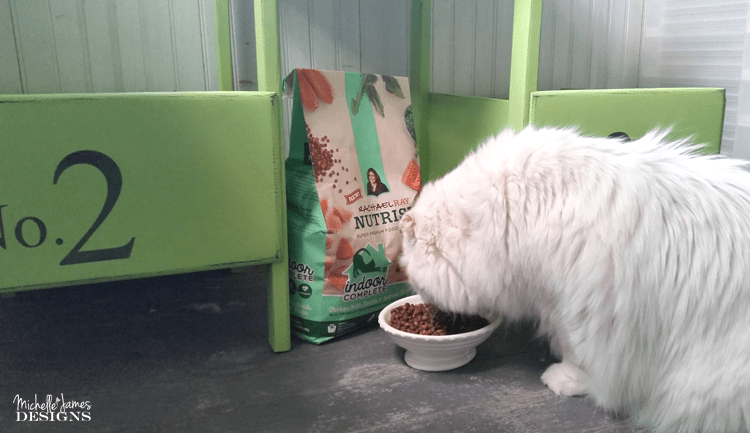 We really love the Nutrish Indoor Complete. So by purchasing this product not only am I helping my little family of kitties but I am helping to save animals all over the world not just in my backyard. That makes me happy. You can find it in stores where you shop for groceries or online at Amazon.com, chewy.com or jet.com I got mine at Hy-Vee. I believe I have seen it in my local Fareway but they were out of it this time. Now I can show you the awesome DIY cat bed we made. This cat bed is made from the last three remaining drawers from the dresser that Jeff and I painted and made into a changing table when Ian was born. That was almost 27 years ago. This is what they looked like when we started this kitty bed. 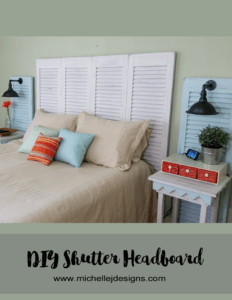 The dresser was red when we got it and we painted it white with the gray knobs. Well, after a number of years it has chipped and chipped. I remember the paint chips on the wood floor that I had to vacuum all of the time when he got older. We finally took it out of the room and moved it to my store to use as storage. It stayed there for a long time and got some water damage. 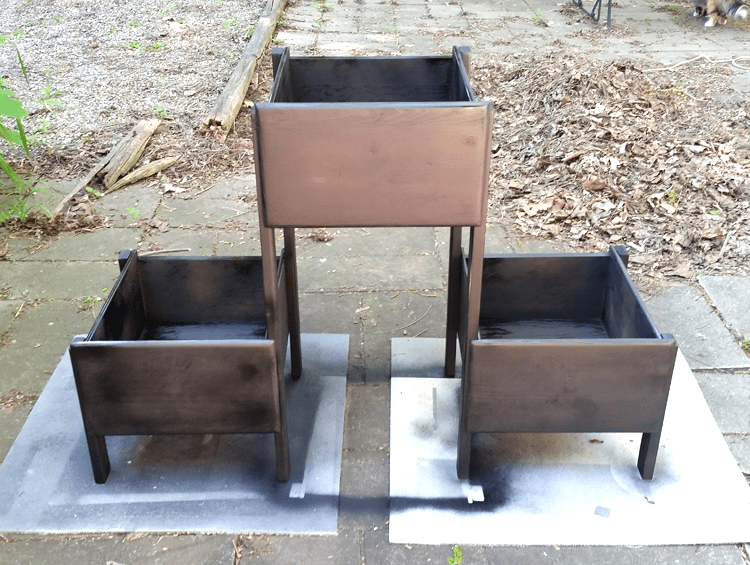 These three drawers were salvageable when we sold the building last fall. I knew I would need to get down to the wood if anything was going to stick. So that is what I did. I sanded and sanded and got a lot of it but ended up using some stripper to get the rest of the red paint off. It worked well and this is what I ended up with. I wasn’t going to replace the knobs so I added some spackle and sanded it down when it was dry. 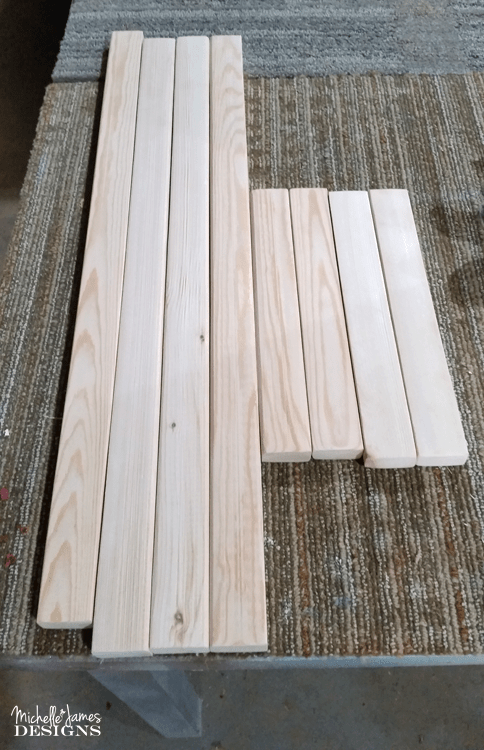 Jeff used these 1×2’s to alter the heights of the drawers. 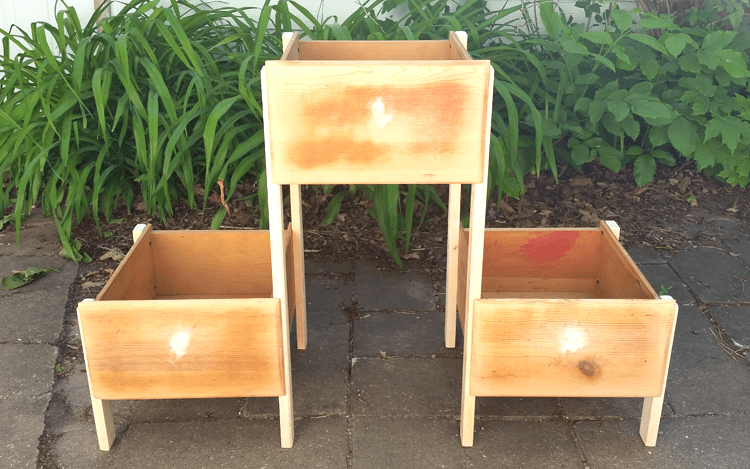 They also served as little legs for the drawers. This was the first stage. 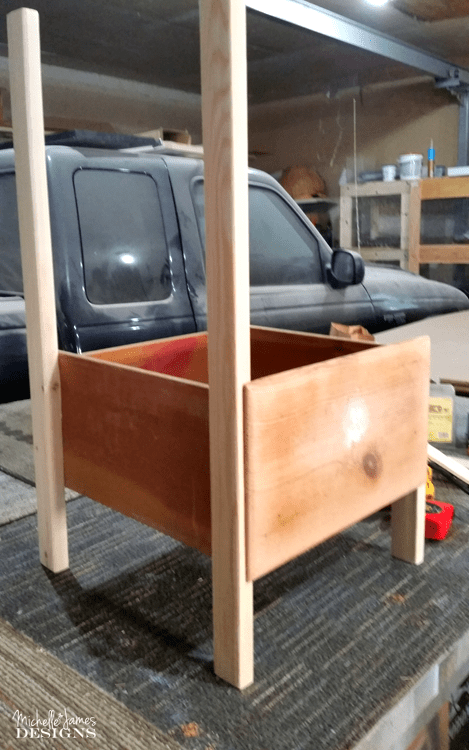 He did the same to one other drawer only opposite then added a drawer in the middle. All of the pieces are screwed from inside the drawer into the wood piece. 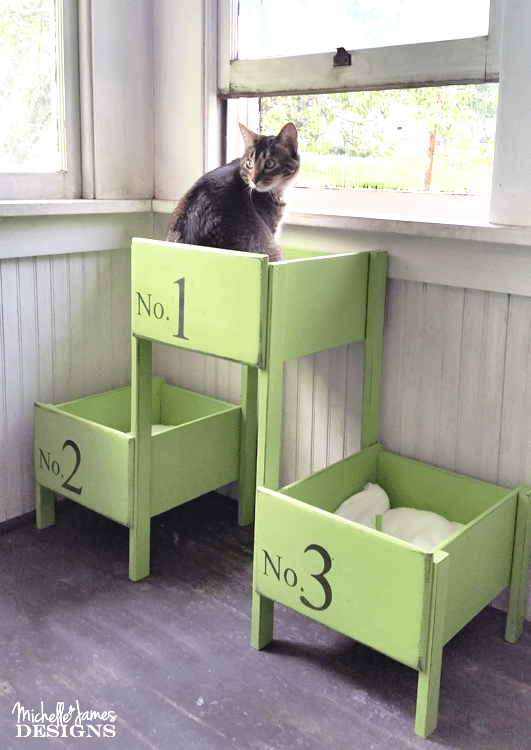 I love a distressed look even for the cats and I always want a darker color to show through when I sand so I started with a black primer spray paint. I chose a bright, fun color for the final coat. 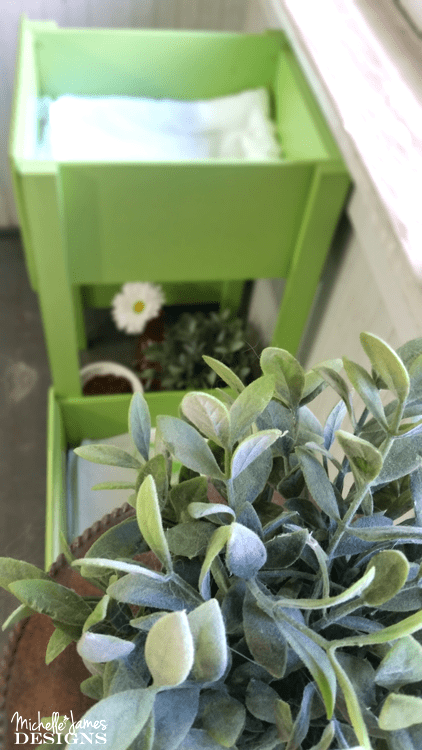 This Green Apple Satin spray paint from Rustoleum is definitely one of my new favorites. 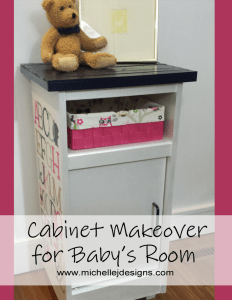 I also used my Silhouette Cameo machine to create some number stencils for the fronts of the drawers. 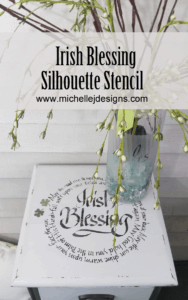 You can see how I create stencils in my sofa table post. It really is quite easy! It is really cute and Sasha enjoys the top level to look out the window. She loves to put her paws on the sill and look out the window. 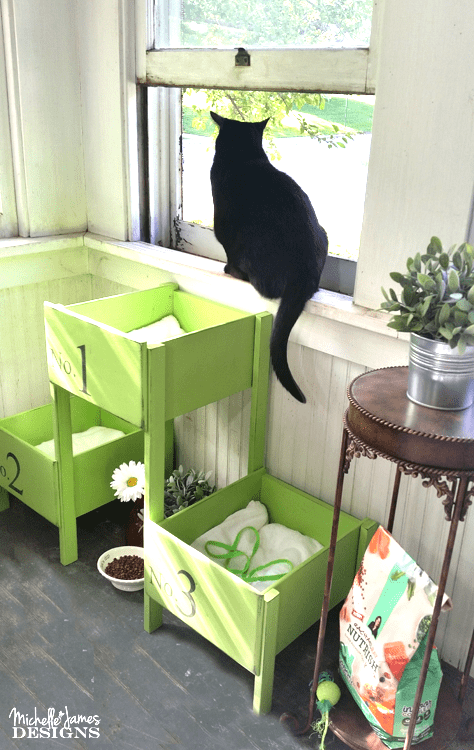 After I snapped a few pics I started to add the food and some other pretty things next to the DIY cat bed for the post. The kitties wouldn’t stay away from the food. Chloe and Sasha even did a little fighting over the bowl. The food was the highlight, not the cat bed. LOL! They really like to be on the window sill instead of in the drawer. What do you think? I am not sure they really like the bed so much but if they don’t use it I can always make it into a nice outdoor planter, right? I like it and I think they will too. Be sure to pin it! 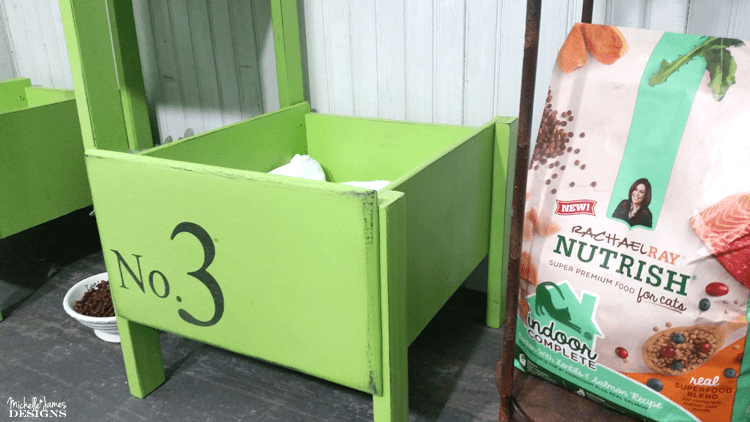 If you like this post about the Nutrish Indoor Complete give them a like on Facebook! Love it, Michelle! Ryan and Liza have sister cats, and when they sit in the window, they refer to it as the “cat TV”; they just sit and watch the world go by. I’m sure your furbabies will love their new beds. Thanks Nancy! They do love a good window seat. I am so glad you like it. Hi Heather. I think that I need to adjust the font setting for my new theme for comments. LOL! It didn’t come in in all caps so why is it showing all caps when you write it? It is a mystery. Anyway thank for the nice words about the cat bed. I hope they take to it. I see Sasha in it every once in a while! Hi Peggy! I have not tried that yet. I will though. It sounds like how a cat’s mind works. Thanks for the suggestion and I am glad you like it. Oh wow Michelle, these beds are too cute! How very creative of you. They must love it so much! Hi Carolann! So far they only love the food and not the bed. LOL! Cats are finicky and I am hoping they will warm up to it. Wow Michelle! You did such a great job! 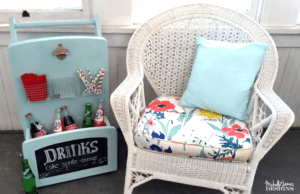 I love the color & i can totally see this has a bea planter if they dont use it! Also what a wonderful thing taking care of the straY cats! That is not easy! You are awesome!! Thanks Michelle. I am looking at the cat bed now and Lizzie is above it in the window sill just like the others do. I may yet become a planter. I will give it more time though. It is new. If I had used cardboard boxes they would be fighting over it. LOL! Thank you Amy! If they all went to the cat bed at the same time they would have to share. This just means we have too many cats. LOL! Great question followed by great answers. This was a lot of fun. Thanks for sharing. Now these are one of the most wonderful things you have created. 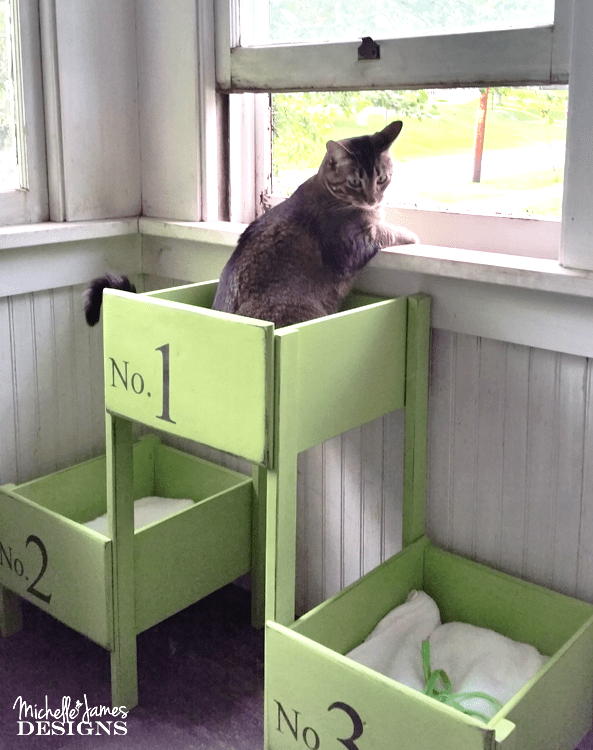 I just love the kitty beds made out of old drawers. You always take things to the next level. Awww thanks Sue! You always leave such great comments. I always appreciate you stopping by!